/PRNewswire/ — The Habilitation Center (www.habcenter.com) announced today that they had attained certification to AS9100 Revision C Quality Management System (QMS) for aviation, space and defense organizations. Certification to this high standard demonstrates the Center’s commitment to continuous improvement in production quality, customer satisfaction and delivery performance. The AS9100 quality standard is based on ISO 9001 which added stringent requirements specific to the aviation, space and defense industry. Among other changes, revision C brings the standard in line with ISO 9001:2008 and expands the scope of coverage to include land and sea based systems to defense applications. The requirements for quality management are second to none. Manufacturers, suppliers and service organizations succeeding in this highly competitive market are those who regard quality management as a key business driver. The Habilitation Center is now registered in the Online Aerospace Supplier Information System (OASIS). The Company’s registration number is 14539. The certifying body, National Quality Assurance USA (NQA) completed its audit in November 2012 and awarded its certification to the Habilitation Center on December 11, 2012. The Habilitation Center is a turnkey contract manufacturer dedicated to providing high tech manufacturing opportunities to men and women with special needs. 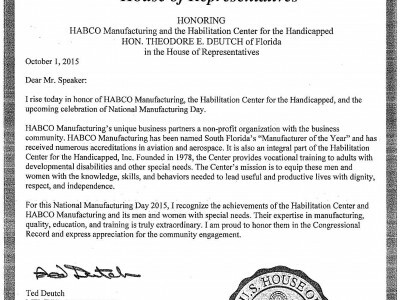 The Habilitation Center was honored to receive the “Manufacturer of the Year Award” from the South Florida Manufacturers Association. A NISH/Ability One affiliate, this 501 (c)3 non-profit organization was founded in 1976. Serving over 250 adults with disabilities, the Center operates in a state-of-the-art environment and is sophisticated in turnkey logistics and supply management, engineering and production. The organization is flexible enough to support a high mix, low to high volume product with the ability to change priorities based on customer need thereby providing a variety of solutions. Utilizing an ERP system and seasoned professionals, the Center is able to provide expertise in planning, purchasing, inventory management and production control to ensure on time product delivery. Areas of expertise include: Electronic and mechanical assembly, cable and wire harness solutions, repair, recycling and refurbishment, kitting and warehousing, product test and contract packaging. The Company has diverse experience in a variety of market sectors including electronics, aerospace, pharmaceutical, telecommunications, government and industrial. 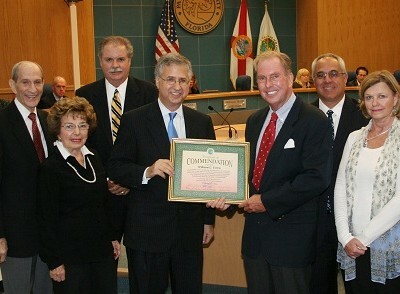 Please call (561) 483-4200 to learn more about the Center and its Manufacturing Services or go to www.habcenter.org.